When the hot tub is not being used make sure all air controls are in the 'off 'position so that cold air is not drawn into the tub when it is in filtering mode, chilling the water in the process! Buy a floating thermal cover that sits on the surface of the water. 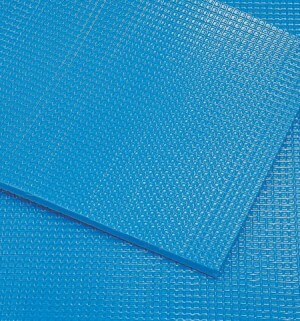 This is a flexible dense polyethylene foam that is very easily cut to the internal shape of your spa and provides a very effective additional layer of insulation. Buy a Cover Cap to fit over your tub's cover and prevent heat loss through any gaps or openings that may exist between the cover and the hot tub shell. Don't leave your hot tub empty and let the plumbing freeze! 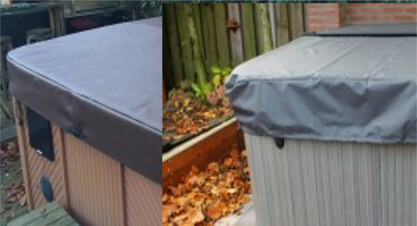 Why protect your hot tub cover with a cover cap? Because, even though marine-grade vinyl is resistant to water, the cover stitching is vulnerable and will rot before the vinyl if it is left constantly wet. Because dirt, mildew and debris can become ingrained into a cover over the winter, leaving stains that spoil the look of the cover and potentially shorten the life of the vinyl. Because a hot tub cover cap can can provide an additional layer of insulation in cold weather that will help keep your electricity bill down. 12mm thick Thermalux foam floating heat retention covers are ideal for spas and small hydrotherapy pools running at up to 40 degC. Water evaporation accounts for 70% of heat loss in hot tubs and this cover reduces water evaporation and heat loss by up to 90%. It will also protect your hard top spa cover from chemical vapour damage.